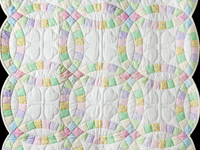 A traditional Ohio Star pattern in lovely, soft pastel fabrics just right for a new baby! Great colors. 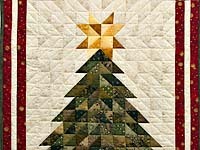 Very nice hand quilting. Well made by a Lancaster County, Pennsylvania Amish woman. 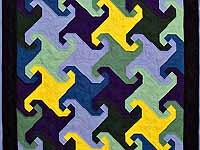 A beautiful patchwork quilt! The fabrics are soft and lovely. 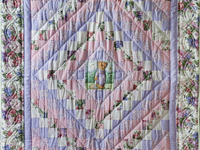 The teddy bear patch in the middle of the quilt is darling! Hand quilted with beautiful stitches. Very well made by an Amish woman living in Lancaster County, Pennsylvania. Notice the cute fabric on the back of the quilt. Includes a sleeve for a hanging rod. Classic Amish Center Diamond design with bright Midwestern Amish coloring. Wonderful colors! 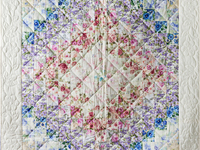 Truly an amazing amount of wonderful quilting. Top made by an Amish woman from northeastern Indiana and quilted by an Amish neighbor. Includes a sleeve for a hanging rod. A lovely blend of rich floral fabrics that give the appearance of a watercolor painting or makes one think of shabby chic. Each floral fabric is gorgeous by itself but together they are amazing! A Trip Around The World design nicely pieced by Lancaster County, Pennsylvania young Mennonite quilt designer, Connie Lapp. Beautifully hand quilted by her mother. Be sure to notice the floral design quilted onto the border. 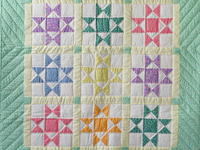 The back of the quilt is covered with the same cream colored fabric as used on the border. 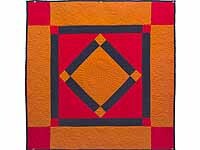 A versatile quilt that could be used as a throw, wall hanging or crib quilt. A tiny, darling version of the classic wedding ring design! 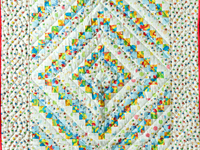 This size quilt would be perfect for a bassinet or cradle. Lovely pastel fabrics! 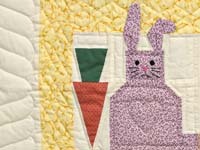 Well made and beautifully quilted with tiny stitches. Made by an Amish woman in her Lancaster County, Pennsylvania home. The back of the quilt is covered with a cream fabric and includes the signature of the lady who made the quilt.